When Lauren Isaacs was 17 years old, she was in an accident that resulted in a major brain injury. After four years in recovery, Lauren made it her mission in life to give help to those in need. “I realized that God gave me another chance at life. I really believe that. It was up to me to choose what to do with it. Would I live selfishly again or give others who need help another chance?” For Lauren, the choice was obvious. Lauren Isaacs is a part time student at York University studying History. 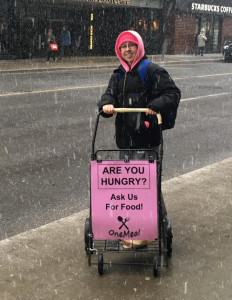 She started OneMeal Inc. in 2015 and the organization continues to grow. The prepared packages are created all on a donation basis, and the organization is completely volunteer-run. 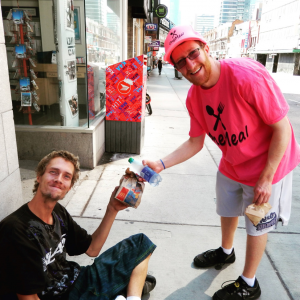 Lauren hopes to continue this work and has a dream of one day opening a shelter or soup kitchen in Toronto. Hungry for more details? 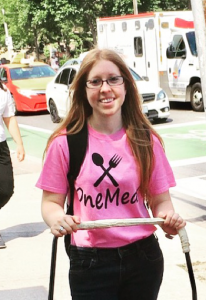 Check out OneMeal Inc. on Instagram, Facebook, and their website to learn more.